I am still working on Graduation cards and hopefully giving you some ideas. I have a couple of nephews that are great baseball players. One is in college and the one that is graduating this year will be joining his brother. I thought this was a perfect stamp set for his graduation card. I didn't use any patterned paper for this card but instead I used stamps! 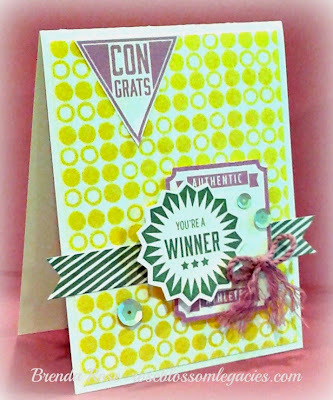 I used canary ink to stamp the background using the Assorted Edges stamp set. The slate diagonal stripe banner is also from Assorted Edges. The other stamped images are from a great stamp set called Team Player. Perfect for sports! And as it turns out, it worked pretty well for graduation, too. The stamps are so awesome that I have to share! Thanks for stopping in today! Be sure to come back tomorrow (Friday) night for the Rose Blossom Blog Hop. 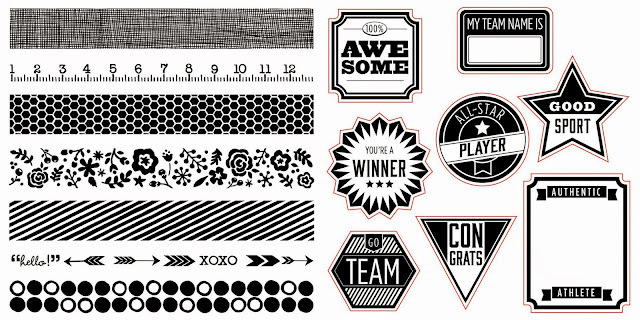 We'll be highlighting the fun Taste of Summer paper and stamps! Love that background. My first thought ... "Uh oh, another stamp set I have to buy." The good news, I already have it - yay. The stamped background is so cute! Love this card Brenda! What a great card! I love using stamps to create backgrounds!